I need to get my son sailing! My son is growing up with powerboats on his mind. Not that I don’t love powerboating, as powerboats serve a very important purpose…. getting you to your sailboat. 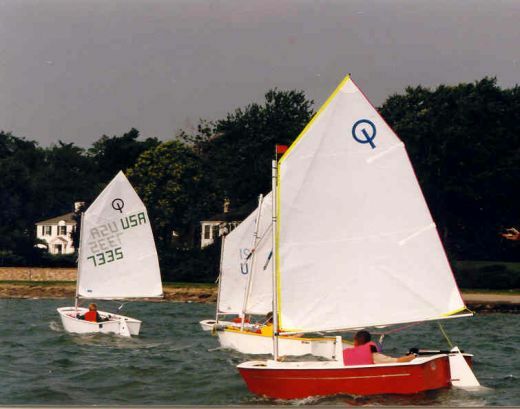 I was very fortunate having spent summers in Cotuit sailing Opti’s beginning in 1974 at the tender age of 7. 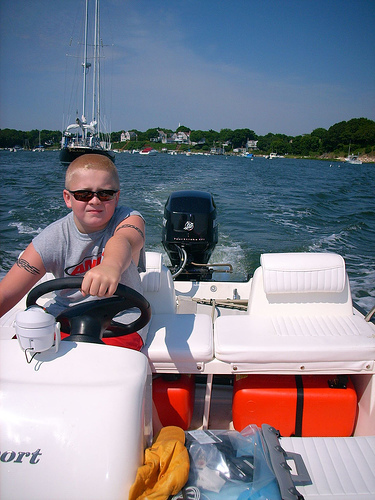 I had no experience with motorboats until I was at least 9 or 10 when my grandfather let me steer his 12-foot aluminum Sears boat with its 7.5hp Clinton Gamefisher engine, the same boat that I got my first speeding ticket in, zooming into the Cotuit Town Dock not knowing the Police Boat “Alert” was sitting there behind the outermost dock. 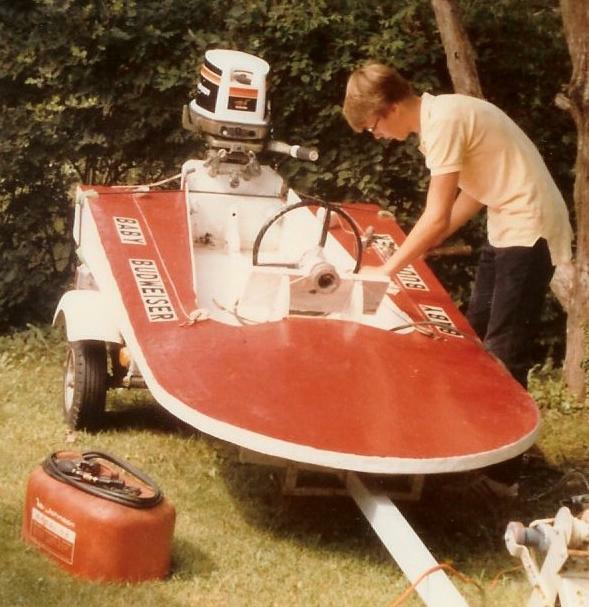 Granted, I did catch a bit of the ‘speed bug” when my buddy Christian and I rebuilt an 8’ foot hydroplane that we named “Baby Budweiser”, which I write about in Freedom Hall. We drove this on Shoestring Bay for a few years where the police boat could not come in because of their draft…. 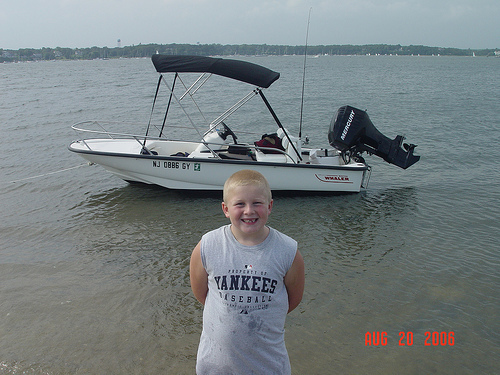 Wanting to give my son everything that I never had as a child, which really isn’t that much considering I was pretty spoiled, I bought my son a 13-foot Boston Whaler when he was 7. Now that he’s 9, I must admit he’s quite the captain. I simply couldn’t beg my mother and father enough to get this Whaler for me! 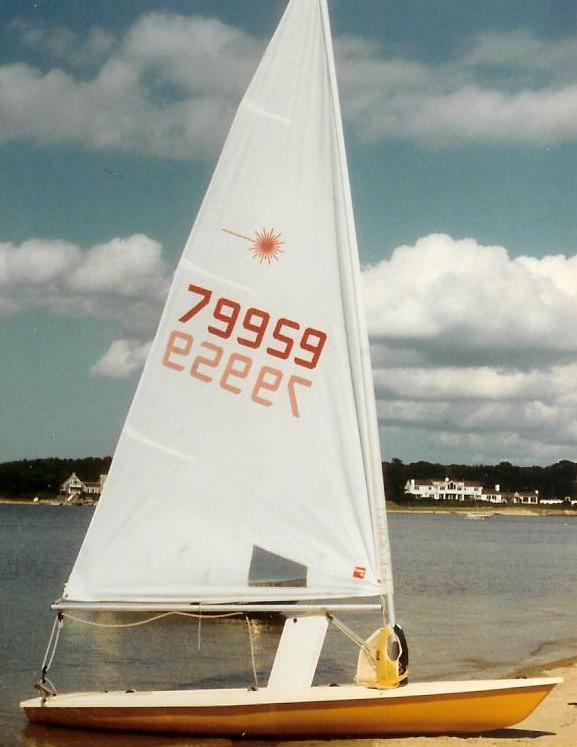 My 1980 Laser is still on loan to my nephew up in Maine who is not quite ready to give it back to me but once he is, I figure my son will not find sailing of much interest….why? I try to tell him that sailing can be as much excitement as it can be relaxing but the ear-to-ear grin on his face as we were zooming down the Barnegat Bay at 100mph told me otherwise. 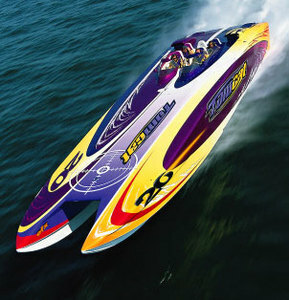 The boat, an amazing machine that defies description, is awe inspiring regardless of how you might feel about speedboats. His grandfather once owned a 50’ Hustler that had over 3,300hp but because it was a single hull, it could only do 130mph or so. This Skater can do over 160mph I am told and has 2,200hp but the cat design makes all the difference in the world. 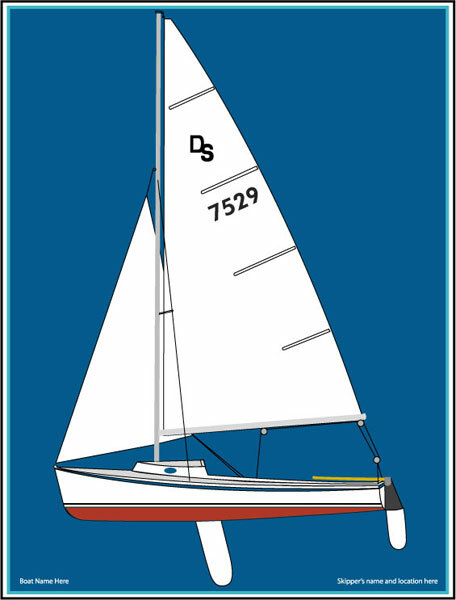 Granted, my goal in life is now a nice big trawler but a small sailboat like an O’Day Daysailor (needs to be fiberglass for me) is also in my future. I would like to say that a big sailboat is in my future, which I thought it was, but for many different reasons I have decided that a trawler is the way to go. 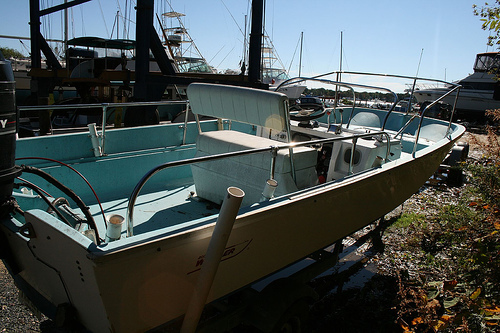 For now, however, my project is a 1969 Boston Whaler Katama (Bet you haven’t heard of that model!) It’s just big enough for Kerry, me and the two dogs and we got it for a steal considering all that it needs is a little TLC….What every Boston Whaler deserves!!! Although I need to lose a few pounds before I can ever sail like I used to, this clip makes me think of sailing on Cotuit bay in my Laser. This video is not of me but I thought I would share it since it shows you just how cool a Laser is.